Join us for our first 2019 Summer Camp Carnival. 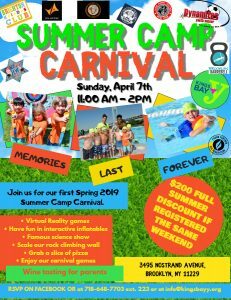 Enjoy carnival games, inflatables, VR Games, reunite with your friends and make new friends, and remember that Kings Bay Y is your second home. Meet our amazing summer camp staff and meet wonderful instructors.